It’s got an i infront of its name and it lets you multitask. 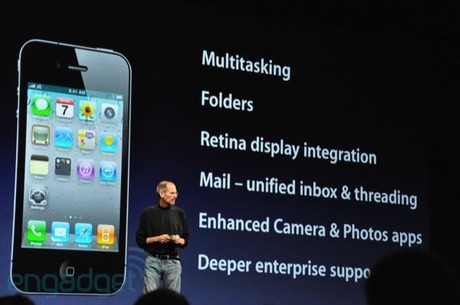 4 years after the first iPhone, you can check the news and your email – at the same time on the iPhone’s new Operating System, the iOS4. Other key features includes folders which let you flick between open apps and in a slightly surprising move, they’ve also included Bing as an option in their search engines. Otherwise the big software updates are all about the apps – iMovie for video editing (with Hipstamatic like themes), iBooks for reading books, commenting on them and sharing them with your iPad. iAds is the other interesting new software feature – something for developers to let them monetise their apps. A sort of Google Ad-Sense that builds a much deeper relationship between the ad and the user. FaceTime makes use of the front-facing camera to allow Skype-like calls, that are kinda cute, but seem to freeze up a bit.